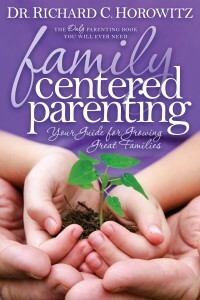 Review: Family Centered Parenting by Richard C. Horowitz, Ed. D.
I am a connoisseur of parenting manuals, having read everything from Dr. Spock’s iconic Baby and Child Care to the popular How To Talk So Your Kids Will Listen, and Listen So Your Kids Will Talk. In my 24 years as a parent, I have combed the parenting literature for advice on just about every issue that has arisen in our family. Horowitz refers to the five main human needs that form the basis of Choice Theory. Understanding these needs can help us determine the reasons for our children’s, and our own, behavior and subsequently redirect our behavior for more fulfilling results. For example, the need for love and belonging can lead a teenager to succumb to peer pressure and participate in unhealthy behavior. The function of the family meeting is to help our child determine other ways to fulfill this need. I find value in his emphasis on exploring our values with our children, learning to find better ways to meet our basic needs, and emphasizing communication and negotiation rather than dictating everything my kids may or may do. Horowitz also provides some useful tips for dealing with special needs such as ADHD and Oppositional Defiant Disorder. Family centered parenting, with its emphasis on the family meeting, takes upfront time and dedication, something that at this point in my life, I am not likely to embrace fully. I also believe that some of Horowitz’s ideas, such as written plans for future behavior and the “Shut Down,” an alternative to “Time Out” used when cooperation is lacking, are unrealistic in the hurly burly of my family life. Bottom line: Family Centered Parenting is a crazy good book. Richard C. Horowitz, Ed.D. holds a doctorate in education from Rutgers University and for over 40 years has worked with families and children in a variety of educational and institutional settings. Dr. Horowitz has served as adjunct faculty at Caldwell College and Fairleigh Dickinson University. He is a past–president, trustee and group facilitator for Men Mentoring Men, a non-profit organization supporting men and the redefining of masculinity and is a former Peace Corps volunteer. Horowitz and his wife, Jane Horowitz, a relationship coach, have recorded a series of videos explaining the Family Centered Parenting philosophy. The videos are informal and informative. Mary Rayis is a parent of four and a writer with a blog, ironically titled “Because I Said So,” on wordpress.com. Tags: books, family centered parenting, Richard C. Horowitz Ed. D.